and start the match making NOW! Register FREECreate a FREE Account and start searching. Your soulmate is waiting! Meet proposals which are manually verified by the verification team. The only service that strives to make sure of the genuineness of data. The most user friendly online matrimony experience you have ever had. Easy to use and maximum possible security for your data. The quality in service approved by ISO 9001:2008 certification, we are equipped with latest technology and an active customer support to assist you. Search for your soulmate in a few clicks! Faster and smarter experience in your mobile. At your service to assist you with the best technical features and ready to serve executives. Submit your queries and get replies in mailbox at the earliest! The complete archives and history of support requests are provided for reference. Live assistance via chat from our customer support team. Get your queries answered instantly. We are happy to help you! Get our personal and professional support in making the biggest decision in your life. A relationship Manager to assist you throughout! The first online magazine in Malayalam to deal with topics related to marriage, family life, child upbringing etc based on religious,scientific, psychological and legal perspectives. An online tool to search in Malayalam Quran and Hadees with Subject wise Classification and the first complete web edition of Riyalussaliheen. Nikah in Kerala™ is an ISO 9001:2008 Certified Muslim matrimony portal for Kerala Muslims. The most trusted Muslim matrimonial in Kerala, it’s the No.1 choice of Muslim brides and grooms looking for a Kerala Nikah. 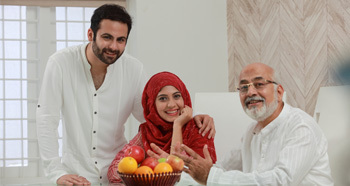 Equipped with advanced features in web and mobile applications, Nikah in Kerala strives to keep the trust of Muslim Parents in Kerala by ensuring the genuineness of profiles through manual verification process. Our dedicated customer support team is ever ready to assist you with your most important chapter in life and our Elite service- An Exclusive Personal Assistance Service makes your way to nikah a simpler and easier experience to reach up to your best partner in dheen. © Copyright 2019 NikahinKerala. All rights reserved.